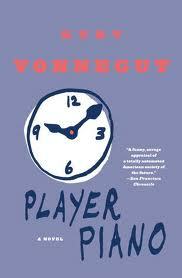 Kurt Vonnegut's first novel, Player Piano, written in 1952, is a prophetic description of a dystopian world run by machines so that human beings have become superfluous. Kurt Vonnegut was a Unitarian Universalist and his influence on American arts and letters is very significant and is an example of the second of the sixth sources of Unitarian Universalist faith, "Words and deeds of prophetic women and men which challenge us to confront powers and structures of evil with justice, compassion, and the transforming power of love." In Player Piano Vonnegut describes a world taken over by technological corporations which have rendered human beings obsolete and makes the Shah of Bratpuhr, the spiritual leader of the Kolhouri, a sect of six million who is touring the United States, to ask the computer, EPICAC "what people are for." Dr. Paul Proteus, the novel's protagonist, is the head of industry in Iliam, NY and struggles to choose whether to continue his work and move on to a future of fame and success, or become the figurehead leader of a rebellion against the machine society. Today, we struggle to decide whether corporations are people and have the same rights or whether they are the servants of a more humane society. We have built a capitalist society where the worship of Mammon and the bottom line supersedes human rights and dignity, and the resentment and rage are simmering just below the surface and is leaking to the surface in the Occupy Wall Street movement and the civil service union protests in Wisconsin, Oakland, and other places. Vonnegut's novel, Piano Player is a testament to the UU principles of the inherent worth and dignity of every person even though corporate power and technology subjugate and oppress millions of people. Justice, equity, and compassion become values of the past when corporate capitalism values money and investor dividends more than the people the corporations were meant to serve. Vonnegut's city of Ilium is divided in three sections: the office and machine park where robots do the work and manufacture the goods, the gated community where the engineers and the managers live, and Homestead where the lower classes live who are forced to either work in the Army or the Reclamation and Reconstruction Corps known colloquially as the "reeks and wrecks." Piano Player is a book for our time even though it was written 60 years ago. The dynamics of the culture which Vonnegut describes has gotten worse over those 60 years rather than better with the further financial inequality between the 1 and the 99%. The governance of the country has been captured by the corporations for economic gain rather than the common welfare. Vonnegut was a Unitarian Universalist and a Humanist. The moral of the story of Player Piano is that human dignity requires that human beings stand up to the faceless power of the robot machines and the corporations which have dehumanized millions in the name of profit and greed. In the battle between money and human dignity it seems that money is winning but there a few of us who realize that money can't buy you love and that love is by far more important than money. Player Piano is a bleak indictment of what we have become as a people in the name of "progress". We have sold our souls to the devil and as we progress through the 21st century it becomes increasingly questionable whether civilization as we have known it will survive. It seems that with our technology, especially carbon producing machines that use fossil fuels we have poisoned our own home on planet earth so that in another 100 years it will be unrecognizable. Vonnegut as an artistic prophet has tried to warn us but too few of us especially those in power who stand to gain in the short run financially have heeded his artistic vision of what we have done and are doing to ourselves. You can support the UU A Way of Life by buying books with the Amazon carousel widget in the right column. Thanks for the review of Player Piano. I read it years ago when I was in college and remember that some people called it science fiction. It is not science fiction at all but a satirical description of our technological modern life with its dehumanizing characteristics. It is more true today after 60 years than it was when it was published in 1952. I think it should be a required read for any thoughtful American or citizen of a first world country. Vonnegut is one of those prophetic men and woman which UU draws from as one of its six sources. I wonder how many UUs take him and his work seriously?